I only have a three day work week because of the 4th, but it has been such a long week! We are cleaning out the storage unit for all of the companies old files and it is hot dusty work. All the lifting has definitely been a work out so the experience hasn’t been a total loss, but consequently I’ve haven’t been good for much in the evenings. I even convinced myself that reading through emails while watching TV counted as multitasking and was therefore a perfectly rational use of my non-work hours. Plus it’s been raining so it wasn’t like I could do the yard work I’d been planning anyway. So while I was multitasking last night, I clicked around one of my favorite online t-shirt stores looking through the new designs and poking around the sales section, after that I did what every crazy cat lady does and searched the site for “cat” shirts. Here are six of my favorite. I limited myself to six, but there are more, a lot more. After me exclaiming “I want this one too” more than I dozen times the husband stopped looking at each new picture and resorted to making non-committal noises or nodding. Our Pre-Thanksgiving Shindig was yesterday afternoon and we had a blast! My brother-in-law’s girlfriend and I made construction paper headdresses for our men; and almost everyone took part in coloring in pictures of overflowing cornucopias harvest scarecrows and smiling pilgrims Sometimes it’s nice to relive the good old days, when long division was as hard as it got, and a fruit rollup in your lunch box was the coolest thing EVER. With the count down to Thanksgiving well into the single digits, I wanted to share this tutorial featured on Design Sponge to make sure our homes holiday fresh in time for guests. Pour the ethanol and essential oils into the 4-8oz jar. Top off with distilled water. Shake, spritz and enjoy! While you can use pretty much any oil combinations you want, here are three seasonal combinations to get you started. Photos also from Design Sponge. I was having brunch with some friends last weekend and since it was one of the first chances we’d had to catch up in a while we were going through the list: jobs, family, health, friends…you get the idea, and after a while the conversation turned to cats: our cats, their cats, new cats…once again you get the idea. We’d been discussing our fur babies for quite a while when one of my guy friends laughed and said, “Have you ever noticed that people with cats, no matter what else is going on, they always end up talking about their cats.” Which is completely accurate, I talk about my cats as if they were my children, I ask my other cat friends how their cats are doing, and we sit around sharing the newest pictures that we’ve taken on our cell phones. All that, and now I have a HUGE board on Pinterest about cats, not even my cats, other cats and comics about cats. I can’t seem to stop! I think I may have a problem…. I’ve always considered myself to be a “cat person”. I still love dogs, there is a little corgi in St. Pete named Ruby Louise who steals my heart every time I see her, but like children I never really thought owning a dog was for me. Obviously, if you’ve been reading this blog for any length of time you know I’ve since changed my mind on the subject of having children and within the last year or so I have been toying with the idea of having a dog. I love my fuzzy little felines, but they are stubborn and spoiled and they have no qualms about letting me know how little they need me. While that is all well and good, there are sometimes, every now and again, when I would really love to have a pet that was happy when I came home, who would sit for treats or tummy scratches and who would let me get away with doing this. 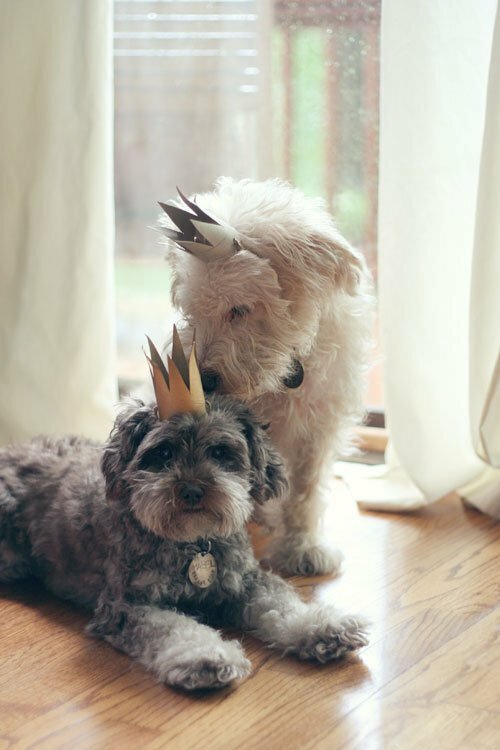 Blogger Amanda Wright, from Wit & Whistle fashioned these adorable crowns from toilet paper rolls, twine and a little metallic paint, to celebrate the 4th and 6th birthdays of her fuzzy children Mable and Oliver. Although the duo weren’t wild about their birthday head gear, they were willing to indulge their mom for a few moments in exchange for treats. I tried putting an elf hat on Octavian a few years ago for Christmas….yeah 3 blurry photos and two seriously scratched up forearms later, I decided we didn’t need a Christmas card after all.